Dynamic, ephemeral, ceaseless, relentless… That’s what time is. It passes whether you like it or not. We even attribute the changes in our bodies as we age, or sleeping patterns to a body clock. Ancient Greek philosophers argued hard about what time actually was/meant. Still, I haven’t got time to go into all that now… Theories of time, relativity…whatever, confuse me. 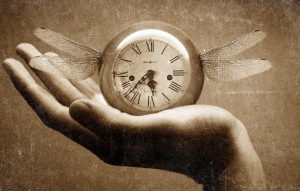 I just want three hands, some numbers and a slower rate, at certain times; you need more time, there isn’t enough…you want less time and there’s too much. In times of pleasantness, I need a geological clock! I remember the first watch I ever had. Well before Christmas I knew I was getting one and I couldn’t wait to get my hands on it…the time dragged on the run up to the big day! 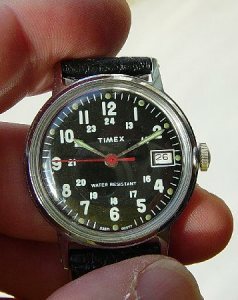 It was a simple Timex with a small window in the black face showing the date. The strap was a lovely black gloss, of course not real leather but that didn’t matter. I strapped it on as proud as punch and simply could not take my eyes from it! Such was the fascination with this watch that for maybe three or four days I would constantly check the time and tell everyone and anyone who was near – the hour, minute and even the seconds; oh, and a reminder of the date too. For a short time too I was allowed to wear it for bed and amuse myself with the glow-in-the-dark hands! For a child that would never sleep without at least having the landing light on, this watch seemed a cure for my acute nyctophobia – bedtime couldn’t come quick enough – well, beguiled by the chronograph for a short time at least. Bedtime became halcyon-like… It was water-resistant too, although I could never quite talk mum or dad into letting me keep it on for the bath. I did occasionally sneak off and pop my wrist under the tap though! I kept that watch and wore it almost every day, no other watch, no matter how expensive, no matter what the brand, would ever take its place. Sadly it met quite a violent end in my twenties and among other things, it was a sad loss. Though how significant or important can a simple watch be, in comparison to other losses? Well, it was with me through times happy and sad aplenty, and one of the nearest and last things I had close to something so dear that I lost at precisely the same time… Only I wasn’t wearing it. This entry was posted in My Words and tagged Dark, Geology, Lost, Patterns, Relativity, Sleeping, Strap, Timex, Watch, Xmas. Bookmark the permalink.